For all Learn to Sail Inquires, please contact the Head Coach Kate Pepler at by email headinstructor@bbyc.ca, or by phone (902) 717-3396. All participants in the Learn to Sail program have to pay the annual Admin fee. This covers Sail Canada's fee as well as our admin costs (except for participants in the Keelboat Learn to Race program and the Women's workshops). Get Sail Canada certified! We offer a Cansail program for adults! Here you will learn the basics of sailing, gain confidence on boats and get your levels. This program is a month long, and meets twice a week for 3 hours. The class sizes are small, so it is very hands on learning. This program is taught on our 420s. We do need a minimum number of participants to run this course, so you will be refunded if we do not have enough participants. This is Sail Canada's program for learning to sail on Keelboats, and our instructors are certified through Sail Canada to teach this course. Gain hands-on experience, with small class sizes. This program is taught on BBYC's J24 fleet. We do need a minimum number of participants to run this course, so you will be refunded if we do not have enough participants. Our level two course will begin to set you up for racing on keelboats. You will gain more confidence on the helm, and learn how to efficiently maneuver the sailboat. We do need a minimum number of participants to run this course, so you will be refunded if we do not have enough participants. *Prerequisite: level 1 keelboat course through BBYC, or demonstrate that you can complete those skills. Have a tough schedule or very particular goals? 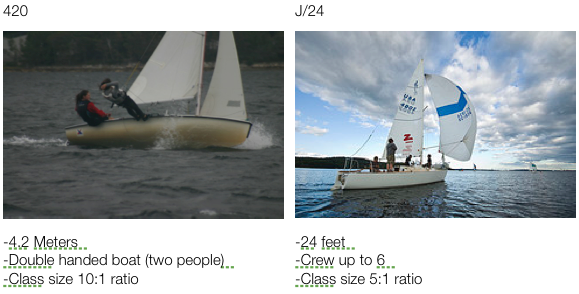 BBYC can create a specific lesson plan for you based on your unique sailing goals. We can also assist you by teaching you on your own boat rather than a club boat. Our instructors are available to teach any skills you might need, either in the classroom or on-the-water. Private lessons are ideal for those individuals or families that want special attention or have limited time availability. Contact the Head Instructor here for additional information on private lessons. Click here for BBYC's Adult Learn to Sail theory package. Click here for the Wikipedia page on 420 dinghies. Click here for the Wikipedia page on J/24s.